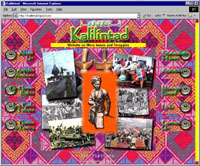 Includes 7-10 pages, one scanned photo per page, eye-catching animated menus (PHP 6,000 / US$120). Additional photos are P100 (US$ 2.50) per 8 * 11 square inches. Recommended for organizations making their spot on the Internet for the first time. Once the site is finished it will be handed over to you via email in *.zip format. You will need a file-extracting program such as WinZip (downloadable for free from the Internet on www.winzip.com). Once you have extracted the website on your local drive / computer you can then upload it to your existing server, if you already have one. If you don't have a domain/server on which to put up your site, we recommend that you get Package 2 instead. You may opt to have your website on a free server. A good example of this is the Kalilintad Website (see the Projects page). Free servers have banners and pop-up advertisements over which VQX SIGNVS have no control. Please note, however, that we will invest some time and resources for doing so, and for this we will charge a service fee of PHP1,000 / US$20 for setting up your free web server account for you. *All text and photos are to be provided by the site owner.